Given the different approaches and options for web content management, it is crucial that business users and IT professionals are empowered to ask effective questions to ensure they end up with the right solution. This sample RFP document was developed to help organizations compare options and uncover differences between specific solutions. 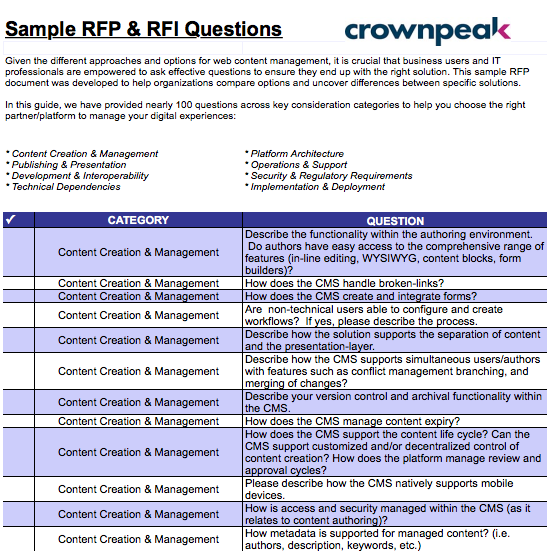 In this spreadsheet guide, we have provided nearly 100 questions across key consideration categories to help you choose the right partner/platform to manage your digital experiences.